What will it take to get to gender balance? What will it take to get to a gender-balanced world? That was the question Emmy-nominated filmmaker and Changemaker Tiffany Shlain asked herself as she embarked on an exploration of women and power throughout history. 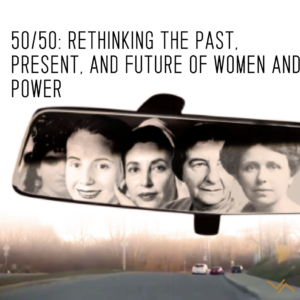 Her new film, 50/50, goes as far as 10,000 years back to examine the role of women in power, from heartbreaking setbacks to tremendous triumphs to the moment in which we now find ourselves looking toward the future. 50/50 Day is about bringing this conversation about the benefits of gender equality to where the change needs to happen – in businesses, institutions, schools, homes, and in a very entertaining and accessible way so everyone can both engage with the subject and take ownership to move things forward. We need to both feel the strength of all that we have achieved, and double down on our efforts of what needs to happen to truly get to a more gender balanced world,” said Tiffany Shlain, Emmy-nominated filmmaker and creater of the 50/50 film and global day, and founder of the Webby Awards. Changemaker Chats is joining 50/50 Day, a global day for viewing this timely documentary and reflecting on what it will take to achieve gender equity in homes, schools, businesses, and society. Join us for screenings in Boulder and New York and check out the 50/50 website for other locations.